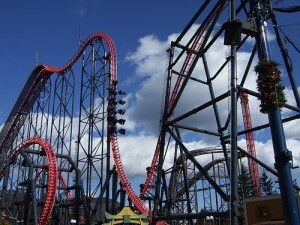 A 4th Dimension roller coaster, Eejanaika at Fuji-Q Highland in [W:Yamanashi Prefecture] in Japan is one of the craziest coasters in the world. It goes through 14 inversions and certified by the Guinness world record for that. What it makes 4th Dimension coaster is that the seats can rotate forward or backward 360 degrees. The name Eejanaika means “it’s all alright”. It derives from the same named carnival-like grassroots movement held in 1867-1868. When the ride starts, one of the staff asks “are you ready for the spins? ?” to the passengers, and the other staff and passengers respond “eejanaika! !” then the ride goes. Japanese Visual Kei Air Band Break Onto the International Music Scene?